Removing the Red Grooms home-run sculpture at Marlins Park is not an option for any new Miami Marlins owners, as it’s owned by Miami-Dade County and is permanently installed at the ballpark. In what was considered to be a weird priority, the incoming Bruce Sherman-Derek Jeter ownership group had identified the possible removal of the sculpture as soon as the 2018 season. The public art in Marlins Park is one area where Loria’s background as an art dealer and investor actually added a lot to the Marlins experience. Yes, baseball purists hate the sculpture, but it does scream Miami — and at a time when the team needs to cement a Miami identity, scrapping one of the most colorful and unique parts of Marlins Park could be a minus, not a plus. “The County commissioned and purchased the Home Run Sculpture with the public art funds generated by the ballpark project,” Michael Spring, head of the county’s cultural affairs arm, said in an email Thursday. It “was designed specifically for this project and location and is permanently installed. It is not movable.”…. Could a new ownership group remove the sculpture? Yes, theoretically, but only if the Miami-Dade commission granted permission for its removal… But Spring, the cultural director, said Miami-Dade’s current position is that the sculpture needs to be treated like the piece of valuable art that it is. “The County’s real estate team will provide any new owner with the requirements regarding care for the County-owned assets,” Spring wrote. 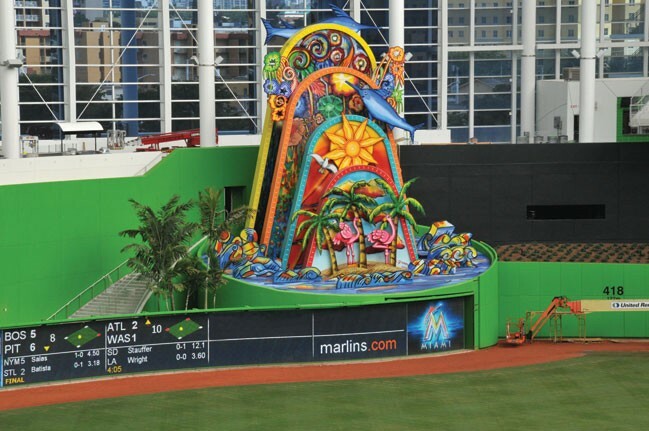 Now, no one with the incoming Marlins ownership actually came out in public and asked for the sculpture to be removed. Is Howard Terminal Out as A’s Ballpark Site?